The 2008 Warriors In Pink Mustang (Sally) options package adds pink accents to the base V6 coupe or convertible with leather seats and automatic transmission. Pink accents include a low pink Mustang side stripe, pink ribbon behind the pony logo on the side, pink seat piping, and other pink stitching and accents. The WIP option is available with performance white, silver metallic, or black exterior paints on the coupe or convertible body styles. Performance White 2008 Warriors in Pink Mustang coupe owned by Sue Coning from Hamilton, Ohio. Sue is holding an award she got for her car. Her husband, Dennis, tells us more, "This is a Susan G Komen Warriors in Pink car. We found it advertised at Louisville Ford a week before Sue's successful breast cancer surgery and picked up two days after the surgery. It is one of her most prized possessions." Black 2008 Mustang Warriors in Pink "Sally" coupe with 17 inch premium painted cast aluminum wheels, pink side stripes with Mustang letters, fog lamps, pink ribbon Mustang fender emblem, and a 210hp (at 5300rpm), 4.0 liter, single-overhead cam, V6 engine. The Warriors in Pink or Sally special model is to promote breast cancer research which starts with a base V6 premium models adds wheels, exterior pink accents, and leather seats and steering wheel with pink stitching. Silver metallic 2008 Mustang Warriors In Pink V6 coupe options package includes P235/44/ZR17 A/S tires, pink tape stripe, Mustang Sally front floormats, GT leather seats with pink stitching, pink stitched leather wrapped steering wheel, V6 rear decklid spoiler, and 17-inch premium painted cast aluminum wheels. Other options on this car include a 5-speed manual transmission and SIRIUS satellite radio. In celebration of Komen's 25th Anniversary, $250 from the sale of each package went directly to Susan G. Komen Breast Cancer Foundation. Ford promotional photo of a 2008 Black Warrior in Pink Mustang V6 convertible with pink stripes, 17 inch painted aluminum aluminum wheels, fog lamps, and special fender badges. The Warriors in Pink package starts with a premium optioned automatic transmission V6 in performance white, black or silver metallic. The pony package is added for the front fog lamps but pink rocker and hood tape stripes are substituted. Other included options include pink ribbon fender badge, charcoal leather trimmed seats with pink contrast stitching, floor mats with pink ribbons, and leather covered aluminum spoke steering wheel with pink stitching. 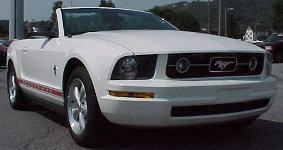 Check out this Silver 2008 Warriors In Pink V6 Mustang convertible. This car has pink rocker stripes, a pink ribbon on the front fenders, and pink stitching on the black seats. It was on display at in East Peoria, Illinois at a 2010 Mustang and Ford car show.